So back to this weekend. Yesterday was a “distance handicap”, where each runner runs a difference according to their ability. I entered the “3km” event, and was given a handicap distance of 2.96km to run. Started out strong on the 1km uphill stretch. The middle part of the event was undulating, before the 1km downhill run home. Although the downhill stretch made things easier, I pushed it pretty hard. Ended up completing the race in 13:59, at a pace of 4:43/min, and scoring third place on handicap. Today was a track meet, to celebrate the re-opening of the local track, after being resurfaced. I entered the 2 sprints offered, namely 200 and 100 metres, as well as long and high jump, and discus. First up was the 200m. Ran well, probably around 27 seconds, but I will never know, because the electronic timing system crashed (which has never happened before), so we had to run it again. 10 minutes later was the re-run, which was a lot slower. 10 minutes wasn’t enough time to recover from a 200m, and the time was a lot slower - 30.33. It was more like a speed endurance training run. After the 200m, I struggled over to the long jump. As I was still recovering, the first jump was only about 3.2 metres, and the second was between 3.6 and 3.7m. Had a longer jump for the third attempt, but was 1cm over the board, making it a no jump. I got a measure for curiosity, and it would have been around 4 metres. But 3.6 something will have to do. Next up was high jump. I haven’t done this since the decathlon, but wanted to give it another go. I opted for an easy starting height of 1.10m, and worked my way up to 1,25m easily. By now it was close to the time for the 100m, so I rushed 2 attempts at 1.30m, before retiring. I used the 100m trip to the start of the 100m at a warmup run, and had another run through, before the race started. Ran 13.76, suspecting this was affected by going lactic in the 200m re-run. Final event was discus. Here, I had my first go at throwing my new weight - 1.5kg for us over 50s, down from 2kg. The smaller discus suits me, and I threw a PB of 17.95m on my third attempt. The new track felt really good, though the incident with the 200m made it hard to see how I’m tracking in terms of training, or the effect of the track on performance. Hopefully there will be another meet before too long. Medal haul from the Victorian Police and Emergency Services Games. Been a bit busy to update posts for a while, due to other aspects of life getting in the way, so just a quick summary of the rest of my season. In athletics, there were only a few meets left. Firstly, the AV Shield Final in mid February. Here, I ran the 200 metres, triple jump and 4x200m relay. Ran a 27.50 in the individual 200m. Triple jump wasn’t as good as hoped, with a 7.73m best jump. The 4x200m relay went reasonably well, though not in medal contention. The athletics season finished with a busy weekend on March 24th and 25th. The 24th saw me competing in two meets. I spent the morning at the Victorian Police and Emergency Services Games in Croydon, where I ran the 100m, 200m and long jump. Results were: Age group (M45) gold in the 100m with a time of 12.71 (hand timed). This result was achieved in a re-run, after the first run of my heat had issues with timekeepers. The long jump started as the rain came down. I got bronze, with a best jump of 3.78 metres. The final event for me was the 200 metres, where I got age group gold and open bronze. Time was 27.84 (hand timed). After the lunchtime medal presentations, I made the short trip to Doncaster East, for the Victorian Masters Track and Field Championships. In the afternoon, I ran the 100m and 110m hurdles. I was entered in the 400m, but elected to leave early and head home for the night, due to fatigue from the long day. With the rain almost cleared, my 100m time was slow, 13.85 seconds, almost a second slower than 4 hours earlier. For some reason, my head wasn’t in the right place. However, 20 minutes later, I ran a PB 27.10 in the 110m hurdles, winning the gold medal. 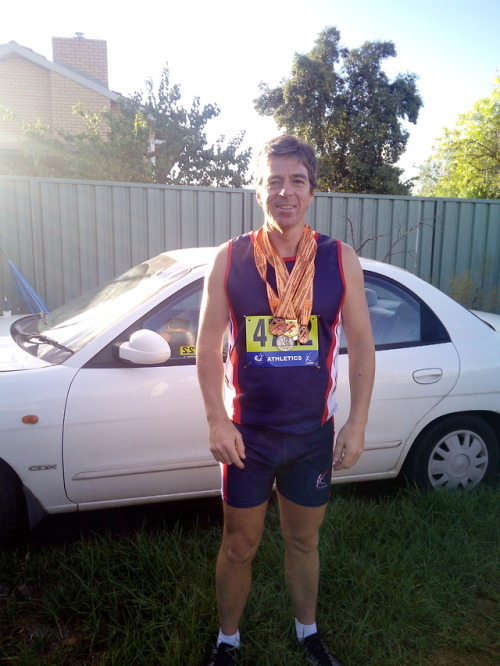 The next day, I returned to the Victorian Masters to run the 60m and 200m. In the 60m, I ran a solid run, with a time of 8.42 seconds, which was one of my better sprints for the summer. In the 200m, I ran 27.34 in tricky wind conditions. While I got no medals on this day, I was happy with my performances. February was also the peak of fire brigade season, with the state championships being held on the March long weekend. Our team improved steadily throughout the summer, with a number of wins and placings in the local competitions. In the state championships, we got third in the Y8, and narrowly missed out on a couple of other placings. Now that the season is over, my focus is on next summer. After a few weeks of relative rest (meaning light training), cross country season has started, and I’m running a few 3km events for fitness in the early weeks, before transitioning to the 1k event. I’ve also started plyometric training to improve my speed and power. There is more big news in the pipeline. Stay tuned for details.